The Spokane Symphony continues its Classics Series with a tribute to the Russian Soul, this Saturday, March 25 at 8pm and Sunday, March 26 at 3pm at the Martin Woldson Theater at the Fox. 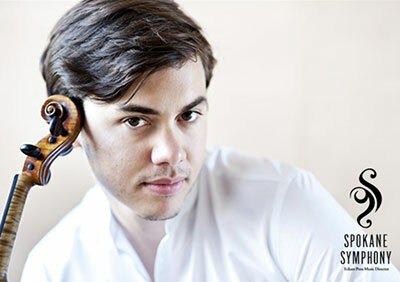 Guest violinist is critically acclaimed Benjamin Beilman, Spokane Symphony Musical Director Eckart Preu, will conduct. 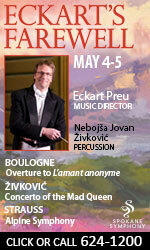 Musical selections include Tchaikovsky's Violin Concerto and Shostakovich's Symphony No. 9. There will also be a special performance of Albinoni's Adagio for Organ and Strings in G minor as a tribute to the late Kendall Feeney who served as Principal Keyboard of the Spokane Symphony. 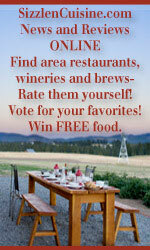 The Inlander's 24th Annual Best of the Inland Northwest Readers Poll results issue will be released on Thursday, March 23. 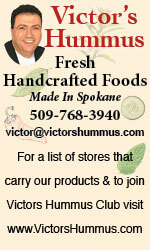 Starting in January, thousands of Inlander readers filled out their 128-question ballot and voted for their favorites in categories from food and nightlife, to the arts and shopping, as well as top picks in Sandpoint and the Palouse. New categories this year include Drink Local, featuring craft brews and local wines, and Music, highlighting their readers' favorite local bands and more. 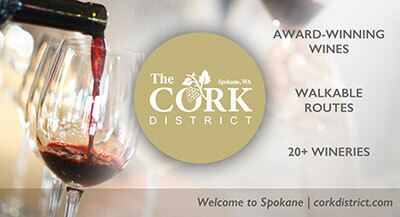 A few of this year's winners are: Best Singer/Songwriter, Marshall McLean; Best New Restaurant, Zona Blanca; Best New Brewery, Bellwether Brewing; and Best Philanthropist, Ryan Oelrich of Priority Spokane. 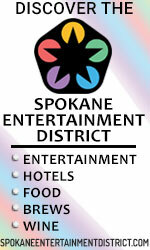 Two local businesses and organizations will be inducted this year into the Best of the Inland Northwest Hall of Fame - a special honor bestowed to those who have won 10 Best Of awards. 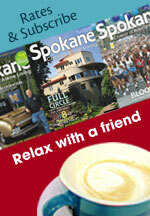 This year's inductees are Pig Out in the Park, Spokane's favorite six-day food and music festival in Riverfront Park over Labor Day weekend, and the Satellite Diner, a staple in Spokane's nightlife scene and recognized by readers for their late-night dining options. 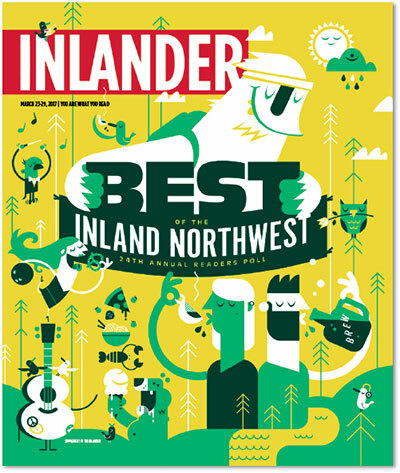 The Inlander's Best of the Inland Northwest Readers Poll is the original readers poll in the region and continues to be the largest survey of its kind in the Inland Northwest. Fox Presents Black Violin, a string duo performing a blend of classical, hip-hop, rock, R&B, and bluegrass music and will have a special performance at the Fox on Saturday, April 1 at 8pm. 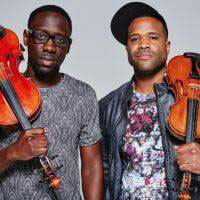 Black Violin features Wil Baptiste on viola and Kev Marcus on violin. They will be accompanied by their incredible band, featuring ace turntable whiz DJ SPS and a drummer. Named one of the hottest bands at SXSW in 2013, Black Violin was invited to perform at Bonnaroo and returned to SXSW this year to standing-room only crowds. 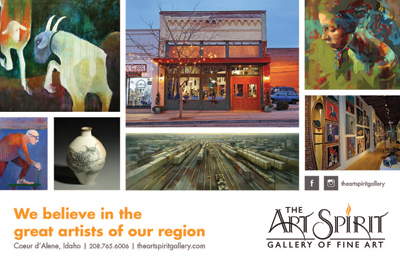 Tickets are available at the Box Office, by calling 509-624-1200. They are also available online and at all TicketsWest outlets. 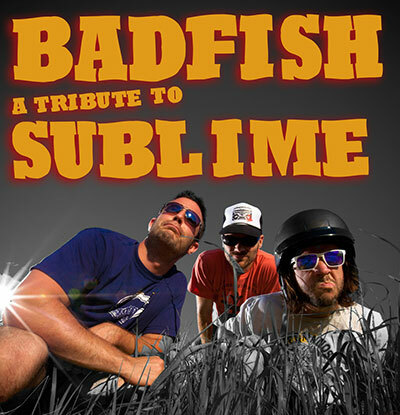 This Friday, March 24 at 8pm, Badfish plays a tribute to Sublime at the Knitting Factory. Go to sp.knittingfactory.com for info and tickets. 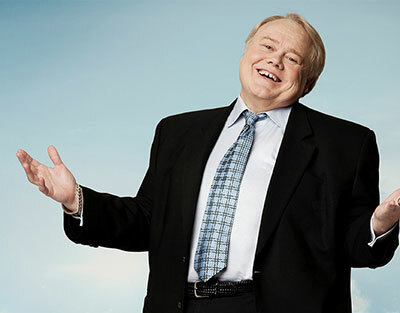 Iconic Louie Anderson, the three-time Emmy Award winner, is one of the country's most recognized and adored comics, named by Comedy Central as 'One of 100 Greatest Stand-Up Comedians of All Time.' 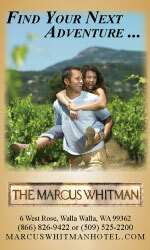 He's going to be on stage at the Bing Crosby Theatre, 8pm on Thursday, March 30. 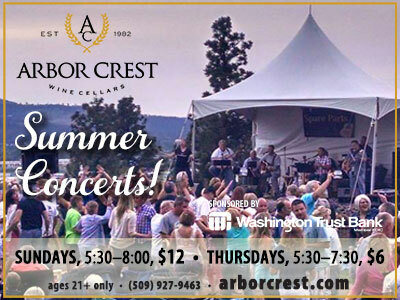 This Friday and Saturday the Fireside Music series continues at Arbor Crest Wine Cellars at 4705 N Fruit Hill Rd in Spokane Valley. 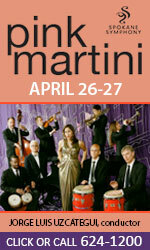 This Friday, March 24, Karrie O'Neill will perform acoustic pop/folk. On Saturday, March 25, it's great classic rock with Spare Parts Duo. Music runs from 5-8pm, no cover. Wine, beer and food available for purchase. Two great rock bands take the stage at Northern Quest this Thursday, March 23 at 8:30pm. Don't miss Great White, joined by Slaughter. America's best 20-and-under weightlifters are headed to Spokane as USA Weightlifting has selected Spokane as the host city for its 2018 Nike National Junior Championships, powered by Rogue Fitness. The event is February 15-18, 2018 and is a qualifying event for the Pan Am Championships and International Weightlifting Federation Grand Prix events. More than 350 athletes and 500 spectators are expected to attend. 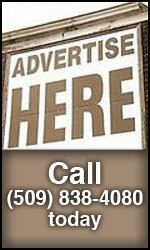 The economic impact will likely reach $725,000 as competitors and their families dine, shop and stay in Spokane. 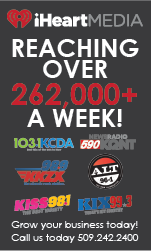 The three-day event will account for 1,200 hotel overnight stays. On Friday, March 24 at 1pm, Holy Names Music Center Recital Hall, Friday Musical will have several special performances with Performing Member Kay Benson, members of the Ignite Community Theatre and the opportunity for everyone to celebrate the arrival of spring with an inspired singalong conducted by President Sharon Rodkey Smith. 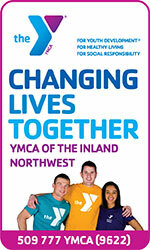 This free program begins at 1pm at Holy Names Music Center, 3910 W Custer Dr, Spokane, just north of the Spokane Falls Community Center Campus. Light refreshments follow, giving the audience the opportunity to chat with the performers. A major part of Spokane's music scene for more than 100 years, the mission of Friday Musical is to 'foster and perpetuate performance, knowledge of and interest in music and the fine arts' in the greater Spokane community. 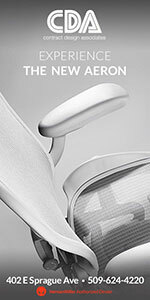 Holding On - Letting Go is on stage at the Civic's Studio Theatre now through April 9. Curtain times are Thursday through Saturdays at 7:30, Sundays at 2. 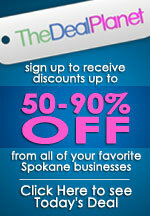 Visit www.spokanecivictheatre.com for tickets and more information.